On April 30, a 31-year-old New York woman took an Uber home around 2:30 a.m. from her DJ gig on the Lower East Side. The woman, who we’re not identifying by name, says she fell asleep in the car and awoke to find her driver caressing her face. The woman says the driver then jumped in the back of the car and tried to kiss her before she managed to escape. You’ll be reassured to know it’s only taken the NYPD and Uber a little under a week to get the driver’s full name and maybe start looking for him. The Uber customer—who has also spoken to Gothamist, in a story they published on Friday—says she called an Uber Black. The car that pulled up was a large black Chevy Suburban with tinted windows (“I was confused at first,” the woman says. “It was huge. It looked like a celebrity’s car”). The woman filed a police report in New York’s tenth precinct on the Lower East Side. The case has been moved to her home precinct, which we won’t identify. She also contacted Uber as well as the city’s Taxi and Limousine Commission, which licenses Uber drivers in New York City. On the same day, the woman spoke with someone from Uber’s support team, who she said was empathetic and called her back several times, but was vague about what the company actually planned to do about the incident. She was told that Muhammad would immediately be locked out of using the app (not fired; Uber drivers are not employees, but independent contractor “driver-partners”). On Thursday morning April 30th, a rider wrote in about an incident involving an UberBLACK driver-partner. The driver-partner in question was licensed by the New York Taxi & Limousine Commission and had passed the TLC background check. 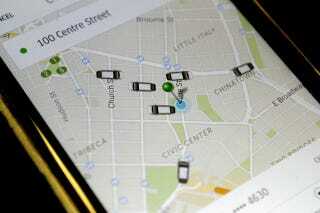 Upon learning of the incident, Uber immediately suspended the driver from the Uber platform and contacted the rider. We advised the rider to file a complaint with the TLC and she reported to us that she did. We also provided trip information to the TLC for the time period the incident took place. We spoke with the NYPD on Friday May 1st and advised them on the process for requesting private information for driver. Yesterday the NYPD submitted a request for information, including the driver’s information, and we quickly provided everything requested. Uber didn’t immediately provide the NYPD with the driver’s last name or license plate number because, per their law enforcement guidelines, they only provide information to police in response to a subpoena. The NYPD, according to Uber, didn’t put in their “request for information”—meaning a subpoena—until May 5. Uber also has an “Emergency Request Form” that law enforcement can presumably use to try to get that information more quickly, but it’s not clear if the NYPD tried that avenue here. I am familiar with the situation, and yes, we are actively investigating. I apologize in advance for any inconvenience this may cause, but as this is an ongoing investigation, it would be inappropriate for me or any representative of the agency to discuss it in any level of detail. Also, while I have no reason to doubt that you are in fact in touch with the complainant, It would also be inappropriate to say anything that could potentially have the effect of inadvertently confirming a complainant’s identity. All that having been said, I will say that you are correct in that all drivers of vehicles affiliated with Uber bases must hold an FHV (For-Hire Vehicle) license, and that I am pleased to be able to report that we have made positive progress in the investigation. The TLC maintains a list of all for-hire vehicle licensees. But more than 200 FHV licensees have the first name Muhammad. If the driver was using his real first name on his Uber profile, and not, say, a nickname or a middle name, the TLC or the police would still need his license number to identify him, which they couldn’t get without subpoenaing Uber. We asked Fromberg if it’s possible the driver could still be taking other passengers; he said he couldn’t comment on whether the driver’s FHV license has been suspended or if he holds other active licenses or permits in New York. When you take a yellow cab in New York City, the receipt lists both a “hack” number and a “license” number; you can look up the license number and immediately locate the garage used by the cabbie, which, if you’re the police, would allow you to locate a driver very quickly. The woman says she immediately deleted the Uber app after saving the receipt. She doesn’t plan to use the service ever again, and she’d like her assailant to be found as quickly as possible.